St. Petersburg is a city that is considered our second capital, called cultural. This is not surprising, because the city amazes all those who have visited it at least once. I want to come back here. The reason for this incredible beauty is the architecture of the city, where there are monumental bridges, magnificent palaces, showing former wealth, fountains and, of course, sculptures and monuments. There is one among all the pedestals that has a very interesting history. And he is dedicated to our great commander, who did not lose a single battle – Alexander Vasilyevich Suvorov. It was still in the late 18th century. When Emperor Paul I reigned, Russia was an ally of Italy and Switzerland, which that year were captured by Napoleon’s insidious troops. The allies had no choice but to ask for help from a great power that could fight back. To which the emperor agreed. But bad luck, the country wanted to see at the head of the army of Suvorov, who at that time was in favor with the sovereign. But what to do. I had to make a wise decision to the emperor and ask the commander to forget the insults and help. After all, two countries were waiting for him. To which Suvorov agreed and came out once again the winner. Of course, Paul rethought the merits of the commander. In gratitude, he decided to erect a monument to him. Moreover, this was supposed to be for the first time, since the monument will be built during life. 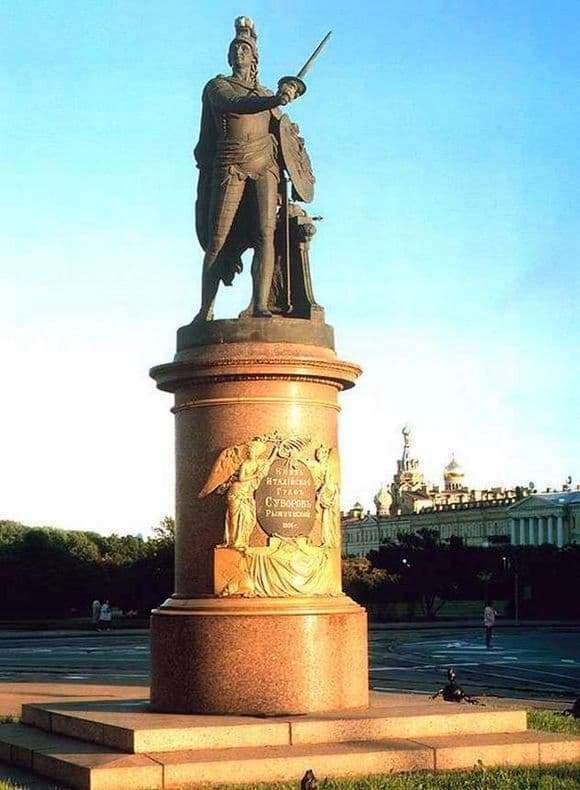 The decision was made, but, unfortunately, Suvorov could not see his magnificent monument, as he died a little earlier. Also, he could not see the pedestal at his palace and the emperor, who also died earlier. But we still see the monument in our days, since the next emperor Alexander I brought the matter to the end.